Charlie the cat checking out the new potato tower. Welcome to the first installment of the potato tower series. The idea of the potato tower is nothing new and there are many variations on the design. This first one that I am showing is constructed out of all dumpstered lumber. The design is very simple. You need four verticals, 2×4’s, 4×4’s, any sturdy lumber should work. And for the horizontals you will need something a little wider and a little thinner. The pieces I have are about four inches by a half an inch. The spuds are planted and mulched with leaves. 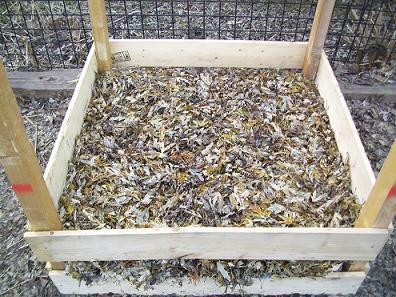 As they grow, add more soil, mulch and boards to hold everything in. I am using pine, so as far as long-term use, I will get a few seasons worth of use before they start to rot. 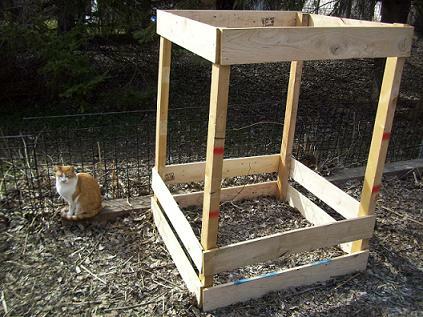 Using cedar or redwood would be a great choice if you don’t want your potato tower to rot, but purchasing these two woods is expensive and not very environmentally sound. An alternative is to find a fencing company and see if they have cedar scraps. Fencing companies typically have a dumpster area open to the public, so you might be able to find pieces from an old fence. Red Norlands that want to be planted! this idea to the extreme. As the shoots start to emerge you let them grow to a height of six to eight inches. 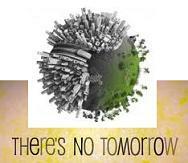 At that point add more compost and soil leaving just two inches or so of vegetation showing. At the same time as adding more soil and mulch to cover the plants, add more horizontal boards to hold everything in. Remember to leave a little space between horizontal boards so excess moisture can escape and also so you can steal a few spuds now and again. Repeat this process throughout the season. 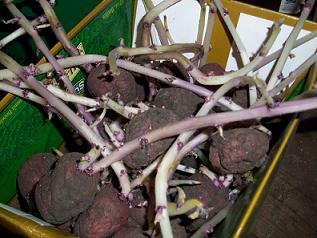 From the research I have done, potato towers can dramatically increase your harvest of spuds. The amount you can grow in less space is almost exponential. At the blog One Straw , they get close to a hundred pounds of spuds per tower. I hope I can get results like that. In this first tower, I planted Red Norlands saved from last year. I put ten, nice sized potatoes into the ground that were ready to be planted. I will be making at least three more towers that will be made out of 55 gallon drums. That article will be coming soon. Until then, Happy Spring and Cheers!